The Macmillan Horizon centre is a hub offering support services for people affected by cancer in Sussex . Established since 2016 their services include information support, money advice, counselling, complimentary therapies and healthy cookery workshops .The café at the centre is opening throughout the week and offers a calm, friendly, welcoming place serving vibrant fresh food and comforting classics. The café acts as a stepping stone into the centre and its services. 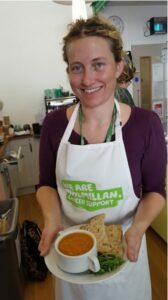 Partnering with Fareshare Sussex allows the Macmillan café to reduce costs therefore spend more on other high quality food products. Emma also uses FareShare Sussex donated food in Macmillans, ‘eat well, feel better’ workshops, designed for people affected by cancer to build their cooking skills and knowledge. Sarah, a former attendee of the workshops who had never cooked before regularly visits the café to excitedly describe what she’s cooked for herself and her family. 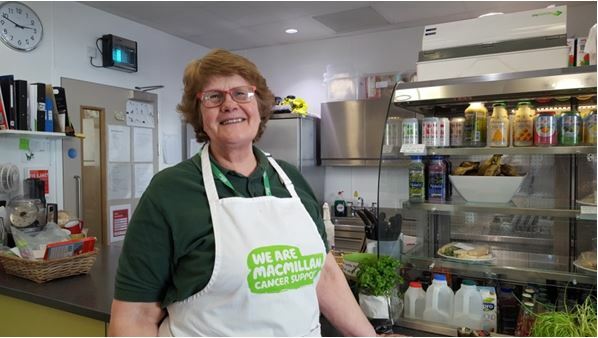 Lyn has been volunteering weekly in the café since the centre opened two years ago. She enjoys the variety that FareShare Sussex food brings to the café. Lynn offers much more than a just helping hand in the kitchen and has a deep understanding with the visitors. 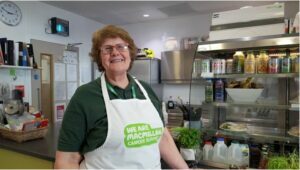 “We offer people what they need whether it’s a hug, a chat or simply a quiet space” Volunteering at the Macmillan café also benefits Lynn, who feels that the other volunteers have become like family to her.